I meet hundreds of people from young to old each and every day. I notice that most young girls look beautiful with heavy makeup, although I myself do not like heavy patch up of creams and colourings. My wife wears no makeup at all. Her skin is beautiful without creams and make-ups. I just wonder why young girls have to spend hundreds of dollars for cosmetics to make up their beautiful faces. I requested dermatologists to examine the female skin from baby to old age from various fields of lifestyle. Our group discovered that people who do not wear any makeup have a healthier and beautiful facial skin. This is especially true among simple old-looking individuals compared to young beautiful-looking girls in the city. What really causes your skin to stain, smear, freckle, and wrinkle? What also causes your dry skin, oily skin, and pimples? Did you know that the incidence of these skin problems is increasing among young girls and not from older people? How did that happen? As you may already know, our face is prone to dry skin especially during winter due to cold air and low humidity. Many young students, office workers, and salesladies try to cover up their faces with creams and facial cosmetics for protection during winter. Based on our survey, we have learned that nearly 100% of women do massages with various kinds of creams and lotions. Some are doing it with a lot of patch up just like the photos below. We have consulted renowned dermatologists and medical professionals for beauty treatment, and told us that the treatment procedures like the photos above may do you more harm than good. Actually, our skin has natural power or energy to replace old cells to new ones and maintains fresh skin, but misinformation of business-oriented pharmaceutical advertisements shows as if their products make your skin more healthy and beautiful. Beauty treatment businesses are one of top money making industries. Do not be cheated by their advertisements! 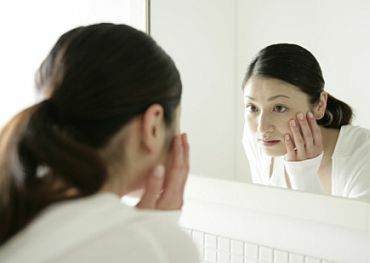 The more you massage and apply face creams and make-ups will only result to rougher skin after few days of application. Then, you will tend to apply even more creams, and the result will be pretty bad. Look at the skin of your grandparents, probably, their skin are healthier and more beautiful than yours. That's what we can really observe. To keep your skin healthy and beautiful, just use your hands by applying soft soap and wash with warm water. As much as possible, humidity should be kept 45% to 60% when you sleep, and that would be good enough. After your simple sleep overnight will make your skin unexpectedly beautiful for your next day. Natural power in your body will keep your skin in its best condition. Refrain from massage and rubbing of your face. Just apply simple facial cream when you go out during hot summer and cold windy winter to protect your skin from direct contact to outdoor temperature and humidity. Skin needs holiday, too. Let your skin rest to avoid contracting bacterial and viral infections. By the way, all of our lady staffs do not use any make up, yet they look so healthy and beautiful than those who come to our office with heavy makeup. The skin cells are continuously flaking off at rate of 35,000 dead skin cells per minute. In one year, you'll get rid of around four kilograms of skin cells. An average person's skin renews itself every 28 days.